Lucinda J. (Minerd) Hall was born on Oct. 2, 1850 in Hexebarger near Kingwood, Somerset County, PA, the daughter of Charles and Adaline (Harbaugh) Minerd. Her husband was a veteran of the Civil War. Lucinda had dark hair and brown eyes. At about age 17, she and her parents moved to a farm at nearby Nicolay, near Mill Run, Fayette County, PA.
On Dec. 19, 1872, at the age of 32, Lucinda married 29-year-old Civil War veteran John K. Hall (1843-1908). He was the son of Garrett and Margaret (Linderman) Hall, of Fayette County, PA, and the grandson of Joseph and Mary (Matthews) Hall. The wedding took place at the home of Lucinda's parents, and was presided over by justice of the peace Thomas Thorpe. The nuptials were announced in the old Uniontown Genius of Liberty newspaper. The Halls' only known children died in infancy -- Lewis, date unknown, and an unnamed son, who passed away Feb. 24, 1874. Their foster or adopted children were Minnie Hyatt, John Clyde Hyatt and Annabelle Miller, who are thought to have survived to adulthood. John was the son of David Ross and Minnie (Castle) Hyatt. The infant sons both are buried at Sugarloaf Cemetery, near Ohiopyle, PA, now the property of the Western Pennsylvania Conservancy. Photographed in 1996, both markers (seen here) have faded badly and are barely legible -- Lewis (left) and the unnamed infant (right). During the Civil War, John served in Co. G of the 107th Pennsylvania Volunteer Infantry. The day after his 21st birthday, on Sept. 6, 1864, he enlisted at Greensburg, PA. The month after his enlistment, however, John had already "contracted a weakness + severe pains in back caused by hard marching + exposure lying on damp wet ground...." He was treated in a hospital at City Point, VA, and later took part "in the battles of Petersburg, Hatcher's Run and Norfolk and...in several skirmishes." 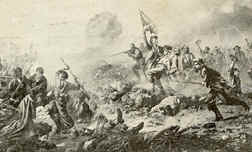 Seen here is an artist's depiction of the infamous Battle of the Crater at Petersburg (later made famous in the Hollywood film "Cold Mountain"). The regiment pursued the enemy to Appomattox, VA, where Gen. Robert E. Lee finally surrendered. He was discharged at Washington, DC on June 6, 1865. In 1900, they went to Chicago to attend a Civil War veterans' reunion. John is profiled with a short biography in Samuel T. Wiley' 1889 Biographical and Portrait Cyclopedia of Fayette County. The feature states that John "was educated in the common schools of the county. He is engaged in farming and stock raising. He served four years as constable of Stewart township, and six years as school director of the same township." A newspaper article once praised the Halls, saying that "There is no more hospitable home in the mountains for the hungry sportsmen than the Hall place. It might be added, too, that a stronger or deeper dyed in the wool Republican than Hall is could not be found." The Halls owned a 168-acre farm on Sugar Loaf Mountain near Ohiopyle, Fayette County. An 1875 newspaper reported that John had seen a flock of 15 wild turkeys in his field. In 1906, a news article noted that he and a neighbor had gone to "Ursina mills to get their milling done." When the federal census was taken in 1880, Lucinda, John and nine-year-old daughter Minnie were counted as making their home in Stewart Township, near Ohiopyle. Lucinda appears to have enjoyed traveling to socialize and visit. An August 1906 article in the Connellsville Daily Courier said that John "was at the [Confluence] station today to meet his wife, who had been visiting friends at Somerset." Sadly, John became afflicted with lung problems in late November 1907. 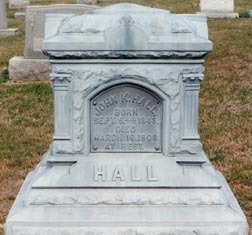 He survived the dead of winter months but as spring neared, at age 64, he died on March 18, 1908. The official cause of death was "Phshisis" which generally means pulmonary tuberculosis. In an obituary, the Turkeyfoot News called him "an honored citizen of Stewart township all of his lifetime" and said he had "answered to his name at the final roll call at his late home... [He] had been sick and failing all winter, and because of lung effection the doctor could not save him." He was buried at Fairview Cemetery (today known as Johnson's Chapel) near Confluence. The Turkeyfoot News added that his burial was attended by "a large gathering of the friends and relatives from this and the adjoining county of Somerset." His elaborately designed grave marker, of a metallic substance of some kind, is seen here. Lucinda lived for another 11 years. The 1910 census shows the 59-year-old "Lucindy" making her home with her daughter and son in law, Minnie and Ross Hyatt and their children, in Stewart Township. By 1918, her mind had become exceedingly feeble, and she was unable to make major decisions or to live independently. With assistance from her brother and sisters, she was given a court-appointed guardian to protect her from becoming "the victim of designing persons..."
She died on May 21, 1919, at the age of 69, and is buried beside her husband at Johnson's Chapel. In August 1924, their daughter Minnie Hyatt attended the Minerd-Miner family reunion, held that year at Confluence, Somerset County.